Amla is a popular plant in India. Did you know that it contains high dosage of vitamin C? What is more, it is perfect for hair and scalp care. It has beneficial impact on organism functions. Let’s see how does amla oil and powder work. Products with content of amla fruits are one of the best for hair and scalp care. These hold intense conditioning, nourishing and moisturising action. Amla strengthens hair bulbs and inhibits hair loss. Regenerates hair ends, restores damaged strands and takes care of scalp. What is more, the cosmetic has antimycotic, antiviral and antiseptic properties. It helps eliminate dandruff and other skin related diseases. On top of it all, amla oil ensures volume and gloss. It is an ingredient of many natural cosmetics dedicated for scalp care. However, it can slightly darken hair colour. 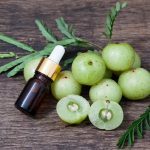 How should you use amla oil? 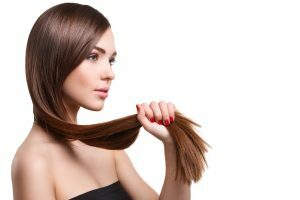 Amla oil is used prior to hair wash. If you care about spectacular effects, apply this oil on a regular basis. You can perform hair oiling and this way take care of scalp and hair at the same time. So that oil become more plastic, before application heat it up in the water bath. Large amount of the cosmetic rub in the strands, hair ends and scalp. If you want nourishing substances to absorb faster, put on plastic cap or a towel. Leave amla oil for few hours. Optimal results are gained when you leave this product overnight. In the morning wash hair with delicate shampoo. Repeat this step until you get rid of unpleasant smell. Leave hair to dry and proceed with stylisation. Amla powder – what is it? Amla fruits are available in from of powder. It has the same properties as oil, however, its use is a bit different. Along with bhringraj powder or henna they create effective hair dye. It can easily darken hair colour and make roots less visible. On top of this, it provides volume, improves coil, eliminates free radicals and stimulates hair growth. 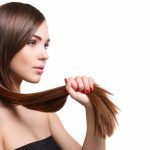 How to prepare hair dye mix with amla powder and henna? With water mix one part of amla and tree parts of henna. Put the potion aside in some warm place for five or six hours. In this time henna will release maximum of the pigment. The mix should change colour from green into khaki or brown. If you want to, you can add few drops of essential oil. Thanks to it your hair will smell great. Amla and henna leave for few hours. The longer time dedicated for the treatment, the darker colour will hair gain. After given time, wash your hair. Remember to remove all the pigment also from the skin of face and ears. Amla is great as a hair conditioner. Mix 100 grams of powder amla and about a teacup of water. This mix apply on hair and leave for 20 minutes. After this time rinse thoroughly product. Remember that amla darkens colour. For this reason it is advised against using it by blondes, who do not look for hair colour change.